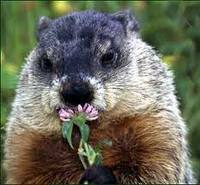 Or Imbolc or St. Brigid’s Day or The Feast of the Purification of The Virgin or, today in 2011, Chinese New Year, it’s the day where, the groundhog sees (or doesn’t see) his shadow, predicting an early spring or the dreaded six more weeks of winter. This year his prognostication is especially dreaded, as we’ve had more than our share of snow and cold weather. As we’ve got a humdinger of a storm predicted, on this, the day before, I think we’ll get the good news of “no shadow” this year. At the mid point between the shortest day and the spring equinox, this is one of the ancient “cross-quarter” days. In the middle ages, people hired workers and made contracts and paid debts on these seasonal markers. Sometimes there were fairs, and always a festival in the Christian calendar to mark the occasion and further to conceal the pagan past when the sun was a deity closely observed. It seems in the heart of winter, but actually, if you check times of sunrise and sunset, you’ll see that days are speedily lengthening. If you are a sheep farmer, you know that the earliest spring lambs are being dropped into an inhospitable world. I’ll never forget watching a calf being born during a February snow storm, finally dropping, into a lanky, steaming pile atop frozen mud. What a welcome to our world! It has been asked whether “red or white” goes best with groundhog, but you won’t get an answer to the question here, even if my old Joy of Cooking does explain how to clean and bake one. I’d rather watch them in high summer, roly-poly trundling between fields, or standing up, on the lookout, giving their shrill whistles of warning. They are dedicated housekeepers, carpeting their dens with leaves, and keeping both a summer den—sometimes tucked under a barn or shed—and a more private winter den for hibernation, back up in the woods or in a hedgerow between fields. Asleep against the bosom of Mother Earth, the woodchuck is supposed to be especially well-attuned to her rhythms. But, as yesterday’s sleet covered crowd at the Punxsutawney Festival kept shouting to poor sleepy Phil, we’re pretty fed up with this year’s Old Man Winter, and we REALLY want him to go away. What a lovely post! I love groundhog day . . . whether the little guy sees his shadow or not, I figure spring will arrive sometime in March . . . Unfortunately, when the winter is as fierce as this one has been, spring can’t get here early enough. Thanks for the great post and I love the picture!